In the stone age, some two and half million years ago, man began to fashion knives from flint. Today, at this very moment in time, around the world, millions of chefs and cooks in the home alike, employ the latest version of this ancient tool with varying degrees of deft to produce an infinite variety of culinary art, such is the creativity and genius of mankind. A few weeks ago, in London Bridge and Borough Market, several individuals decided to use knives for a very different purpose. That very same tool, in different hands, was used to maim and kill indiscriminately, to instil fear and terror, to ferment hatred and to propagate some perverted ideology. This time, as in times before, I have wandered around London just after an attack, going about my business with my natural tan, facial topiary and backpack, feeling slightly conspicuous. This discomfort is purely the result of my fervent neurons over-firing in between my ears: on the whole people are resilient. They make an extra effort to get on with their lives and there is no judgement based on idle stereotyping. 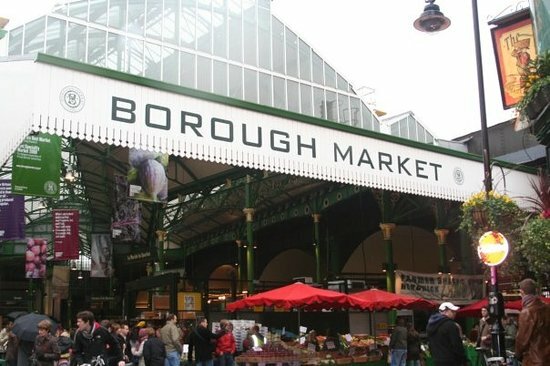 Being a local, both working and living in the area, with Borough Market as my temple, (fortunately I wasn’t in the area on that fateful Saturday evening) the attacks discomforted me more than usual and put me on edge. I went to the vigil which was held in Potters Field Park (where I was interviewed by Norwegian TV) and the opening of the market one Wednesday and have been back to the market many times. I was so, so reassured to see the magnification of the community that had always been there. The market is busier and more bustling than ever (one lady at Monmouth told me their takings were monumental on the first day back), so important given the impact the closure has had on the stallholders. You can see it everywhere: it has made us stronger, people are making more of an effort, and you can feel the love all around. Love looks outwards: it lacks ego, it is selfless. Hatred is a seed which germinates from deep within, is ego-bound and must be deeply directed at oneself before it hurts others. For every one crazed individual who seeks to destroy our values, our freedoms, our way of life with their hatred, there are millions who uphold them with their tolerance, love and compassion. As a born and bred Londoner, I tell you: people like this cannot win, and we won’t let them win. London is, and always has been far stronger than that, and we can see this lineage from the spirit of the Blitz. The more they try and pull us apart, the more we will come together in strength. Recently, I held a dinner party at mine. Knives were indeed used to prepare the food, but no knives were used to kill any animals in the preparation of my shopping (all from Borough Market! ), nor were any treated inhumanely: the dinner was purely vegan. I present you with a recipe from that evening. The vegan cashew nut cheese is my particular take on the many recipes out there on the net, and I thank all those wonderful contributors out there for my inspiration! I take full credit, however, for the idea of stuffing this cashew based concoction into those delicious Spanish piquillo peppers (yes, I googled it and it hasn’t been thought of before). They hail from the north of Spain, and the name is derived from the Spanish for “little beak”: looking at them one can see why! 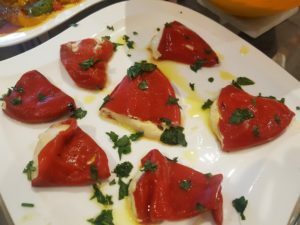 These peppers are often stuffed most deliciously with a thick sauce made with bacalao (salt cod,) and I think this cashew nut cheese is a great vegan substitute, which fits the bill, both in terms of texture and flavour, and in its presentation. I present you with the recipe for the cheese and then explain its use with the peppers. The cheese recipe gives you a big bowl which should be enough to stuff a jar of peppers and have pleny left over to use in the coming days! NOTE: For a milder tasting cheese, use half the mustard, garlic and nutritional yeast. The nutritional yeast can be bought from health food shops and gives a wonderful cheesy flavour to dishes (do not use normal baking yeast as it will taste gross!). Interestingly enough people have started calling it nooch, which I think is a great name! Drain the cashews of their water. Apologies for the volume measurement for the cashews – I put them in my measuring jug up to the 200 ml line but I realise this is not precise and I will provide a weight one day. Place them a high speed blender with the other ingredients and blitz together until the contents are completely smooth. You now have your cashew nut cheese. Take each beautiful piquillo pepper, gently open the natural receptacle in your hand and fill with a large spoonful of the cheese, or until it is filled to your liking. Artfully arrange them all on a plate, drizzle with good quality olive oil and scatter the parsley on top. Et voila, a worthy vegan tapas dish or starter, I am sure you’d agree!